www.southernautoliquidators.comPhone: 407-960-5770Ask about our AUTO EXPRESS LOAN. RATES STARTING AT 3.99%The 2010 Volvo XC90 is big on safety, comfort and functionality. The 2010 XC90 seats seven passengers, and leather seating, power glass sunroof, rear park assist and third-row climate control are standard equipment. An integrated center booster cushion adds versatility to the second-row seat and eliminates the challenges associated with installing a separate child seat.The XC90 swallows more cargo than its competitors, and it comes with features that allow quick, easy tailoring for cargo, gear or people. The XC90 rides very comfortably and it's easy to park. With tow ratings ranging starting at 3,970 pounds, it'll tow light boat trailers, personal watercraft, snowmobiles, and other toys. Volvo's reputation for safety engineering is deserved. Maybe more than anyone, Volvo devotes impressive resources and manpower to improve occupant protection. The XC90 offers the full array of active and passive safety features, including a Roll Stability Control system designed to keep the XC90 from rolling over, and a rollover protection system intended to shield occupants in the extremely unlikely event that a rollover actually occurs. Less obvious are features like a roof structure fashioned from high-strength steel, or a lower front crossmember engineered to inflict less damage on small vehicles if an accident occurs. It may be the safest SUV on the road; it's certainly one we'd feel reassured seeing our loved ones drive. This 2010 Volvo XC90 comes fully equipped with power doors, windows and seats. Ice Cold A/C with dual climate control. AM/FM/CD/MP3 Radio. Warnings and reminders. Sunroof. Tilt and telescopic steering wheel. Cruise Control. Lumbar Support. This car drives like a dream and has so much room! Itâ€™s super clean and looks gorgeous. Come see it for yourself! Call today to schedule your appointment to take it for a test drive. 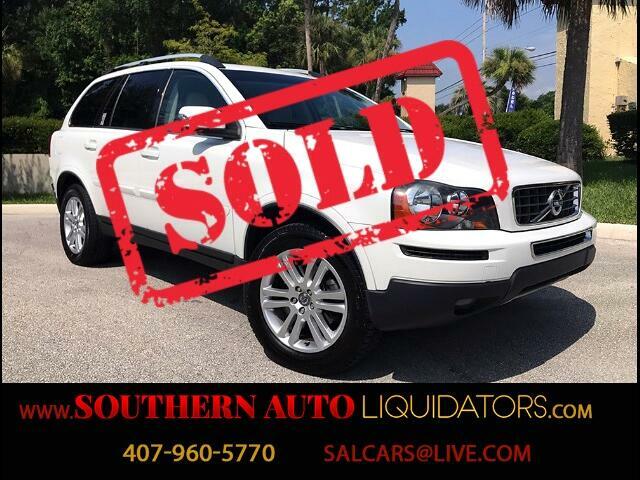 Southern Auto Liquidators1255 Belle Ave. Unit 131Winter Springs, FL 32708Phone: 407-960-5770Get a well-maintained, competitively-priced, Used Car in Winter Springs at Southern Auto Liquidators. We hand select our Used Vehicle Inventory, to offer unsurpassed quality and value.GIVE US A CALL TODAY FOR YOUR PERSONAL APPOINTMENT... 407-960-5770.We Accept VISA, MasterCard, CASH, Debit Card . NEED FINANCING, WE CAN HELP, FINANCING IS AVAILABLE... GREAT RATES!!! Ask about our AUTO EXPRESS LOAN. RATES STARTING AT 2.99% . We can also work with your bank or credit union, please visit your bank or credit union for financing information if you prefer to go through them. Message: Thought you might be interested in this 2010 Volvo XC90.